The successful implementation and scale-up of MDA is a core activity of the ENVISION project. All targeted PC NTDs can be controlled and treated through MDA, using safe, single-dose medicines. ENVISION’s support for MDA efforts follows existing WHO guidelines. 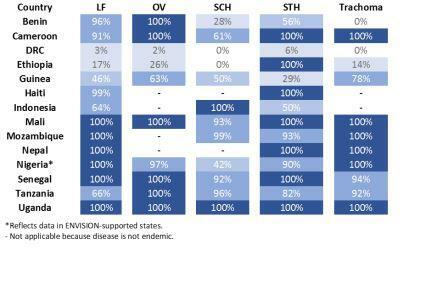 Drug company contributions are key: As of Sept 2015, ENVISION countries have received nearly $6 billion worth of drugs donated by Pfizer, which donates azithromycin (Zithromax®), through the International Trachoma Initiative; Merck & Co., which donates ivermectin through the Mectizan® Donation Program; GlaxoSmithKline, which donates albendazole; Johnson & Johnson, which donates mebendazole; Eisai, which donates diethylcarbamazine citrate (DEC); praziquantel (PZQ), now available free of charge to high-disease burden countries in sub-Saharan Africa, through a donation from Merck Serono to the World Health Organization. ENVISION supplements drug donations by procuring PZQ in some instances and tetracycline eye ointment. See NTD Drug and Diagnostics Procurement. 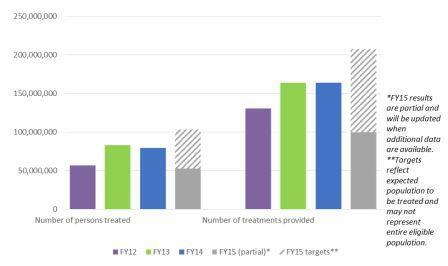 Coverage: ENVISION calculates geographic, program, and epidemiologic coverage to determine whether programs are achieving treatment targets over multiple years. As demonstrated below, MDA scale-up is still needed for some disease programs.